CEDAW65 > The Netherlands questioned over Intersex Genital Mutilations – Gov promises "discussions" - Reprimands expected today - STOP Intersex Genital Mutilations in Children's Clinics! At the 65th Session of the UN Committee on the Elimination of Discrimination against Women (CEDAW), in addition to Switzerland, on Thursday 10 November also the Netherlands were questioned over Intersex Genital Mutilations (>>> archived podcast of the entire session) – thanks to an >>> NGO report co-authored by The Netherlands Network Intersex/DSD Foundation (NNID). 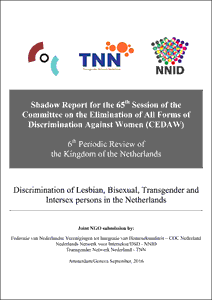 We are expecting stern reprimands for IGM practices for both NL + CH, due TODAY 18 Nov on the CEDAW65 Homepage. "It is reported that the right to determine one's gender is not fully respected in the Kingdom of the Netherlands, and this amounts to discrimination in law practice and policies. Intersex persons still need judicial approval, and transgender persons need an experts-letter from a doctor to get access to legal gender recognition. Intersex newborns in the Netherlands are still routinely submitted to medically unnecessary and irreversible surgeries and other normalizing treatments without the free and informed consent. The UN Rapporteur on Health and on Torture both recommends States [to] end these practices. Are there any plans in [...] place, to guarantee access to legal gender recognition for both intersex and transgender children and adults? Is there a new plan to implement mechanisms to protect intersex children against experimental medical treatments without their free and informed consent? And finally, are you planning to optimize law policy and practice to lower hate crime rates, and to ensure that human rights violations against them are investigated, and alleged perpetrators are prosecuted?" "... and then the question of Mrs. Nwankwo about the position on women and health, and child and adult [...] unnecessary surgery, and good access to health. Since July 2014 changing one's gender on the birth certificate has become an administrative act for which medical interventions are no longer needed. If, however, trans people wish to undergo surgery, so as to have their bodies resemble their perceived gender, they have that option. In all cases, free and fully informed consent is required. As for intersex people, on November 14th, an expert meeting organized by the ministry for public health, welfare and sport, is set to take place, where medical professions, interest groups, and policy makers will discuss this issue. So, in a very short term, next week, we will have an expert meeting to discuss the problems and the challenges relating to intersex people. The government will be happy to report about the progress being made at a later stage, after this meeting has taken place. Then the question about how we prevent violence against ill-treatment of intersex children or intersex persons. The government has received signals that there are several issues concerning ill-treatment and violation of [the] rights of intersex persons - unfortunately. To discuss these issues, the government has organized this meeting I already mentioned, and this is ... let me add that this meeting is also ... I see it as a start of a process to gather more information on this issue, to determine what could be the best healthcare for intersex persons and to determine what the relevant stakeholders and the government can do - and as already said, we are happy to inform you later about the results." IGM = Violence, Torture and a Harmful Practice – NOT "Controversy or "Debate"! This blog hopes more details on actual outcomes of the mentioned "discussion" to emerge soon – and expects both the Netherlands and Switzerland to be sternly reprimanded for IGM practices later today!